Most of us graduate high school with a basic understanding of history, math, science, and literature, but when it comes to personal finance—arguably the topic that we use most in our daily lives—we feel lost or overwhelmed. No longer! Cast aside your fear of FICO scores and your confusion about credit cards, because Scott Gamm, founder of HelpSaveMyDollars.com and student at NYU Stern School of Business is here to help. 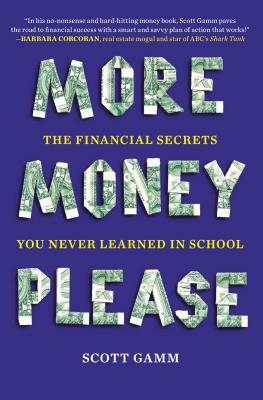 A must-read for college students and recent grads, MORE MONEY, PLEASE will show you how to take control of your finances. Scott Gamm is the founder of HelpSaveMyDollars.com, a financial website focused on helping consumers save money. He has appeared on NBC’s Today show, CNBC’s Closing Bell, MSNBC, CNN, Inside Edition, Fox Business Network, ABC News, and CBS. He is a writer for CNBC.com, Forbes, and TheStreet.com, and a contributor to The Huffington Post and BusinessInsider.com. Scott has contributed to articles for FoxBusiness.com, the Associated Press, Reuters, Family Circle, USA Today, Woman’s World magazine, and others. Scott studies finance, marketing, and communications at New York University Stern School of Business.